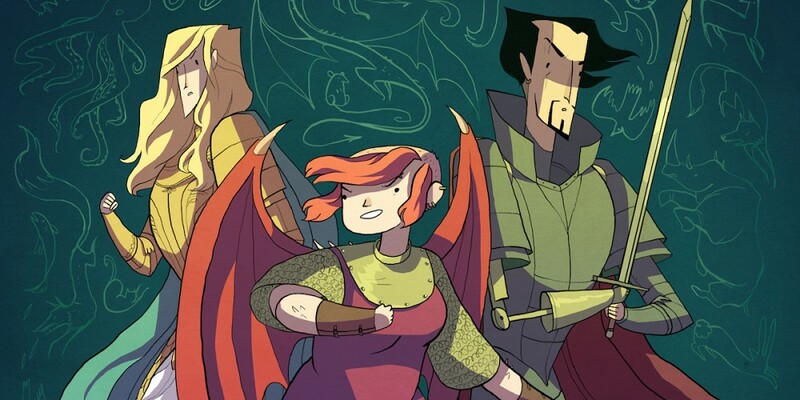 I'm late to the party on Nimona, but boy am I glad I got here eventually, because Nimona is awesome. The story starts with Lord Ballister Blackheart, the archvillain of a fantasy kingdom (albeit one with a lot of familiar-seeming technology); he meets Nimona, a redheaded, jerkin-clad would-be sidekick who offers to help him with his nefarious plans. "Offer" may be too mild a word; "insists" is more like it. Blackheart relents and takes Nimona in, and quickly discovers two very important facts about her: 1. she is a lot more nefarious and ruthless than he is, and; 2. she is shapeshifter who can take on any form, large or small, of any living thing (even Blackheart!). Blackheart and Nimona make an interesting team. She's a lot more interested in thoroughgoing conquests than he is, and is unconcerned with his dumb, outmoded ideas of fair play and chivalry. She tells him an improbable origin story about being given powers by a witch and using them to fight off raiders, and we start to get a picture of Nimona as a kind of scarred survivor of violence whose own psyche has been derailed by her trauma, and whose cheerful anarchy plasters over a dark, brooding nature. Blackheart's nemesis is Sir Ambrose Goldenloin, the chief hero of the authoritarian Institute of Law Enforcement, who was once Blackheart's best friend -- until a fateful jousting match in which Goldenloin broke the rules and shot off Blackheart's arm (Blackheart has a super-cool mechanical prosthesis). There's clearly a little more to it -- Noelle drops very broad hints that the men were also lovers, or something like it. Goldenloin and the Institute aren't necessarily a good fit. Though he is their undisputed champion and their benevolent public face, the Institute's own ruthlessness (including, we learn, the development of dangerous superweapons) doesn't really jibe with Goldenloin's belief in fair play and the rule of law. This is brought to a head when the Institute and Nimona come to one another's attention, and are set on a destruction course that can leave only one standing. With Goldenloin and Blackheart as reluctant proxies with divided loyalties, the fight that brews has a wonderful, rich complexity that works as a fine counterpoint to the slapstick and snappy dialog that Stevenson excels at. What emerges is a story about official corruption, loyalty, the rule of law, whistleblowing, civil disobedience, and the true face of monstrousness that works on so many layers. This is one of the best YA stories I've been treated to, just the kind of thing that young people -- and the adults they become -- can use to think through the complicated moral questions of how to choose the least-worst option from among many terrible ones.